In seeking to generate interest, our aim was to reach Greater Manchester’s diverse population – and be able to prove we had done so. 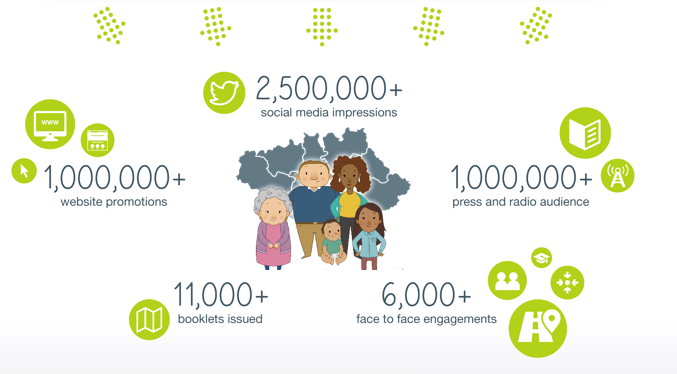 This meant embracing a multi-channel approach to communications and outreach. develop a campaign resources and communications toolkit so that all partner organisations, including the 37 health and social care organisations, police, fire, voluntary and community organisations and the ten Healthwatch organisations across Greater Manchester could help to promote the project. Each of these was given regular updates on how the campaign was doing and tactics to support the promotion of the campaign. to sign-post residents to our virtual and physical events. design a process that can sign-post seldom heard people to virtual the projects events (as described below). identify great work in the region that can be celebrated. 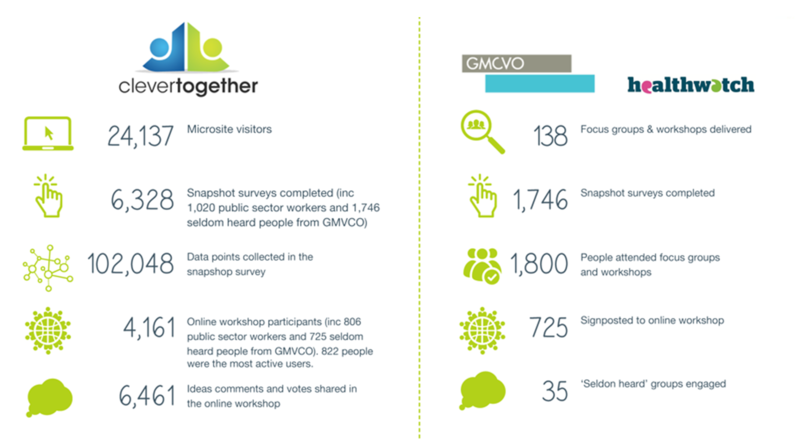 a short snapshot survey – a questionnaire gateway to the online workshop that was designed by Clever Together to shed light of the health and health wishes of the GM’s people. Finally, as a way to incentivise involvement, the steering group also used the mandate to design a competition for the public to win a set of family bikes (this was administered by Clever Together). 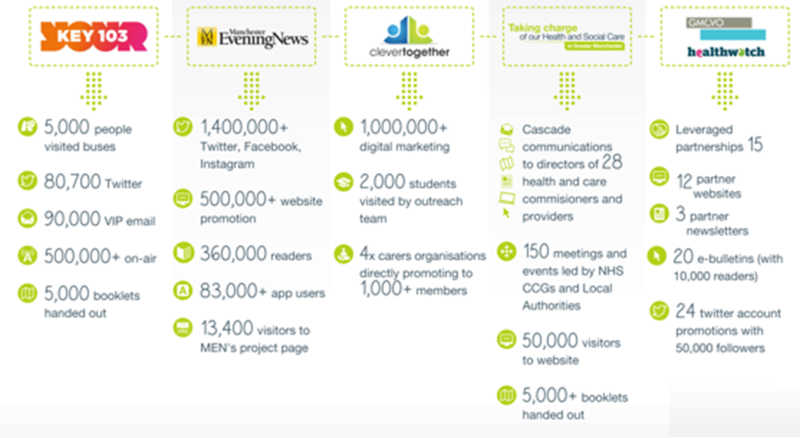 Collectively, the project group members’ engagement reached people from every corner of Greater Manchester. we captured demographic information to prove we had indeed engaged with a representative sample of the region. A table to show where our participants live in the 11 areas of Greater Manchester. We did, however, have a slight skew toward women involved in the snapshot surveys and online conversations (63.5%). Clever Together’s guidance to empower community advocates and volunteers to promote and join the online workshop and survey. During this period, Key103’s radio and web broadcasts and MEN’s editorial pointed the public to the public survey and online workshop hosted by Clever Together. 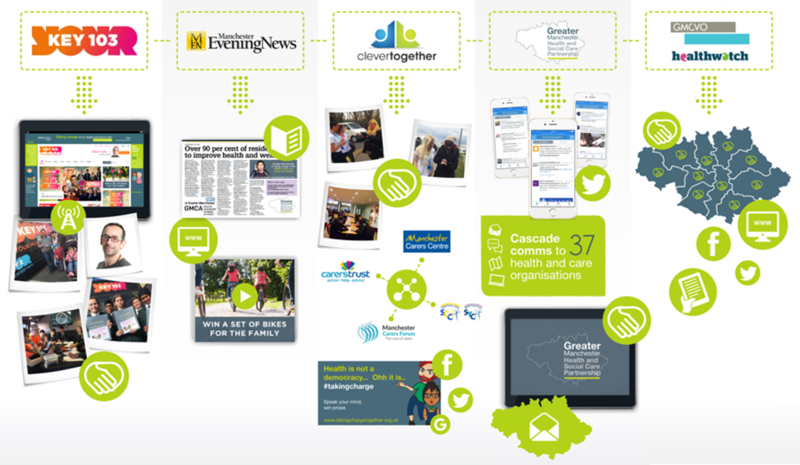 Whilst Clever Together used its digital marketing and physical outreach to build public interest. Simultaneously, Clever Together worked with the GMHSC Partnership to identify a network of organisations that support carers and enrol them into a dedicated digital event to explore the issues face by carers. the workforce that provide health and care to the people of GM. The virtual events (crowdsourcing platforms) were closed at the end of March, two weeks after the Key103 community road shows had finished.